118 pages | 11 B/W Illus. 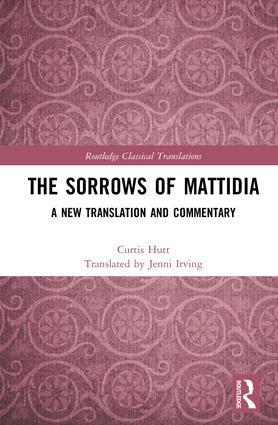 This volume offers a new translation of the Pseudo-Clementine family narrative here known as The Sorrows of Mattidia. It contains a full introduction which explores the obscured origins of the text, the plot, and main characters, and engages in a comparison of the portrayal of pagan, Jewish, and Christian women in this text with what we encounter in other literature. It also discusses a general strategy for how historians can utilize fictional narratives like this when examining the lives of women in the ancient world. This translation makes this fascinating source for late antique women available in this form for the first time. "The Sorrows of Mattidia is a fictional story in the Ps-Clementine writings that narrates the adventures and conversion of a noble woman to Christianity. The authors’ approach to these texts with their complex conceptual and methodological problems is well argued, and a new translation based on a text-critical reconstruction of the Greek Homilies is a welcome addition. These texts from the Ps-Clementines are generally interesting and will hopefully generate worthwhile discussions among scholars and students." Chapter 1: What is The Sorrows of Mattidia? Curtis Hutt is Associate Professor of Judaic Studies at the University of Nebraska at Omaha, USA, and the Founding Executive Director of the Leonard and Shirley Goldstein Center for Human Rights. Jenni Irving is an epigrapher and lecturer of Ancient Languages and Classical Studies at Macquarie University in Sydney, Australia, and the University of Nebraska at Omaha, USA. She also is an instructional designer for a Fortune 500 company.